After Jorge Ramos, Univision/Fusion anchor and one of the best journalists on television, was attacked by Donald Trump for doing his job, the Washington Post thought it prudent to run a story about how Ramos is becoming an “activist” because he cares about immigration reform, like so many other immigrants. In Michael E. Miller’s “Jorge Ramos is a Conflict Junkie, just like his latest target: Donald Trump,” Miller essentially accuses Ramos of practicing a conflict of interest for telling his story as a Mexican American former immigrant. Ramos isn’t just another political reporter, however. A naturalized U.S. citizen, he has become an increasingly vocal supporter of immigration reform. It’s a role that has helped him cross over into English-language news, but also blurred the line between journalist and activist. And both [Trump and Ramos] view argument as a form of public combat. Trump is crass and scattershot, like a scathing verbal shotgun: capable of hitting anyone and everyone in an expletive-laden fury. By contrast, Ramos is tightly focused — usually on immigration — but no less dangerous, like a sniper rifle. “My only weapon is the question,” the anchor told the Los Angeles Times in 2013. Ramos has also proved a pain in the side of Democrats, particularly the president. When Obama didn’t keep his 2008 campaign promise to pass immigration reform, Ramos grilled him about it on live television four years later. In an interview with the New York Times in January, however, Ramos said his focus had shifted. “Now is the turn of Republicans,” he said. With the rise of The Donald, Ramos is now living up to his threat. The basic premise which Michael E. Miller purports to be defending, and the perspective from which he presumably believes he is writing, is that of “journalistic objectivity,” which is essentially “gotta hear both sides.” It’s the concept that a reporter must only report the facts, and never approach a subject from a place of personal emotion or opinion. Yet these three examples — which happen to involve the current White House, although every White House spins stories — provide a window into a particular failure of the press: allowing the principle of objectivity to make us passive recipients of news, rather than aggressive analyzers and explainers of it. We all learned about objectivity in school or at our first job. Along with its twin sentries “fairness” and “balance,” it defined journalistic standards. 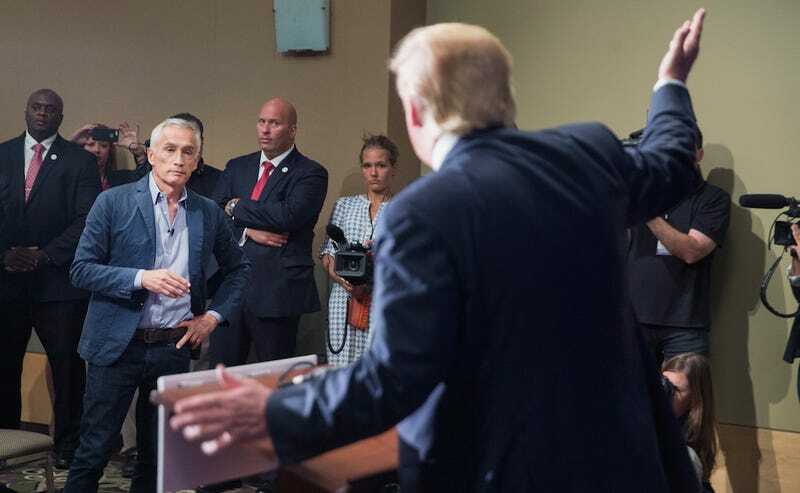 In essence, being an “aggressive analyzer and explainer” of news is why Jorge Ramos is one of our most valuable anchors; it’s what he was doing in that press conference with Donald Trump, and what he does every day with politicians. In telling Trump, “Here’s the problem with your immigration plan. It’s full of empty promises,” Ramos was being as respectful a reporter as could be; the fact that he was able to address Trump’s unfathomably absurd concept of reform (mass deportation) as an immigration “plan” as though it were as serious as any proves as much. Michael E. Miller notes that Ramos has also been tough on Barack Obama. Here he is doing so, being as aggressive with the President as he was with Cruz. No partisanship here. Ramos is focused on asking the candidates about immigration because it is one of the most important issues facing our country today, and as a Mexican American who has been in the same position, he not only has a particular understanding of the issue, he is giving a voice to Americans who don’t always have one. For Miller to imply that he is an “activist” simply because he, too, was an immigrant, is uncomfortably close to racial profiling. Also: Jorge Ramos has been doing this for 30 damn years. If he’s an advocate for anyone, it’s the millions of Americans who trust his reporting to be both ethical and fearless, and who look to him for truth.